Slow cooker butternut squash soup with simple ingredients, it’s so rich in flavor and healthy. I used the pre-cut butternut squash from my local Costco to save time and of course, it’s so much easier than cutting and peeling fresh butternut squash. This creamy soup is made without heavy cream. 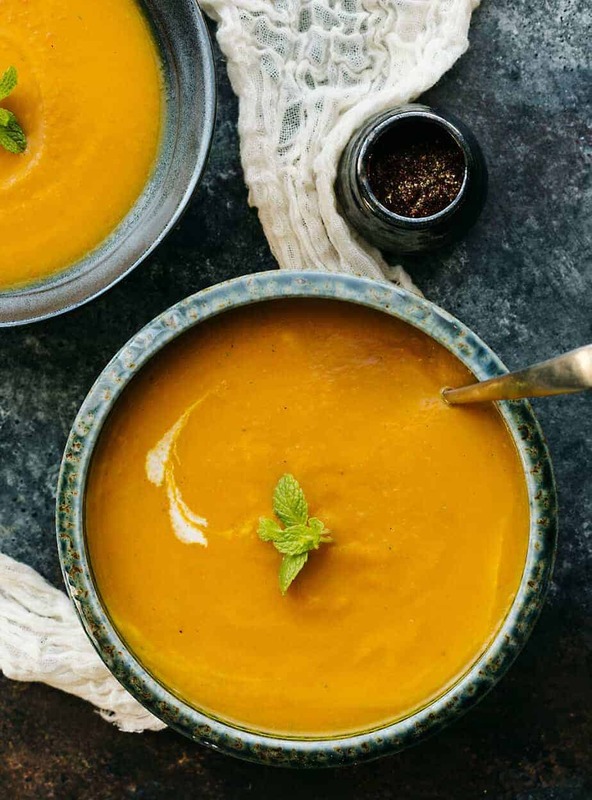 You can use coconut oil in-place of butter to make this butternut squash soup even healthier. This is the perfect creamy soup for fall, winter or any time of year! My kids and husband couldn’t stop eating this soup. Butternut squash is very healthy and has a sweet, nutty taste similar to that of a pumpkin. It provides significant amounts of potassium, highest levels of vitamin-A, carotenes and vitamin B6. Also good for cancer prevention, better eyesight and weight loss benefits. Hope you’ll enjoy this easy slow cooker butternut squash soup. Here’s one of the products I used: Imagine – organic vegetable broth. Heat the butter in a medium pan and cook onion, celery and carrots until tender. Transfer the mixed vegetable into a slow cooker and add squash, vegetable broth, turmeric powder, cayenne powder and a dash of nutmeg. Cook for 4 hours, or on low heat for 7-8 hours. About 1 hour before serving time, transfer the squash and vegetable chunks mixture into blender. Blend until smooth and return the mixture back to slow cooker. Optional: use 1 teaspoon maple syrup or more to add sweetness. This recipe looks so delicious and I love that it isn’t made with heavy cream. As much as I love heavy cream, I need to make healthier options for my husband, so this is great. I also appreciate that it is a slow cooker recipe, I’m all about using my slow cooker! Now this is one great looking recipe. Of course, any recipe that is in the slow cooker is alright by me. I love butternut squash soup, the sweetness and the flavors come together perfectly! I would love to make this one of these days! It’s comfort food for me, plus I’m curious about adding that maple syrup as well. I’ve never tried that before. quash lover here! ommyy.. butternut squash soup sounds very tasty and then i saw the pic ! it makes me want to make one now!! thanks for posting the recipe! I love this kind of soup. I made a similar one last year when I have plenty of butter nut squash from my garden. 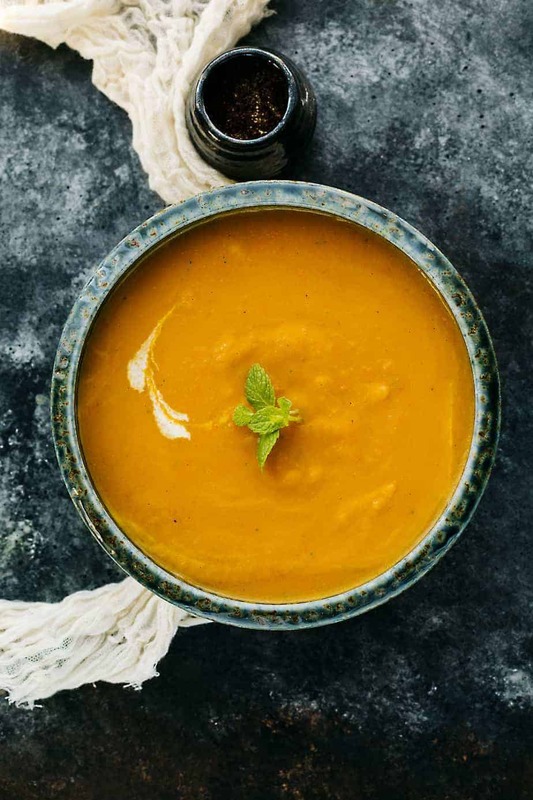 I have been feeling under the weather lately because of the rains so this Creamy Butternut Squash Soup will do the trick! So easy to make too! Butternut squash soup is one of my favorites, minus the peeling and cutting of the squash itself. I can’t wait to try out this new recipe. I finally decided to try butternut squash recently and I loved it. Now I want to make every recipe I can find for it. I’d like to start with your recipe. Really like the texture of this soup! Nutritious and tasteful. The vibrant color is always a crowd-pleaser! Thank you for this great recipe!